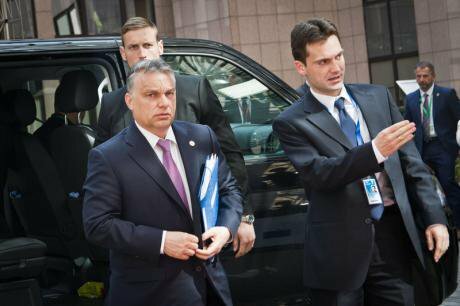 Viktor Orban arriving at EU Summit on migration, April, 2015. Demotix/ Aurore Belot. All rights reserved.For central and eastern Europeans, free movement of people is the most cherished benefit of European integration. Governments in Warsaw or Bratislava have a habit of reacting indignantly to attempts by the UK and others to curb the benefits of migrant workers. They fight tooth-and-nail to preserve the integrity of the Schengen system and rightly speak out against anti-migrant rhetoric from British politicians and commentators. Yet, so far, they have remained comfortably aloof from bearing any costs that arise from the flip side of Schengen: dealing with the influx of refugees and irregular migrants from the conflict-torn and poverty-stricken southern neighbourhood. This paradox was in full effect last week as the Commission unveiled the European Agenda for Migration, which includes binding quotas for the resettlement and relocation of up to 20,000 migrants as a way of spreading the refugee burden more evenly across member states. The 2004 entrants, who accept negligeable numbers of refugees or asylum-seekers and whose small migrant communities tend to come from neighbouring states, came out most forcefully against the mandatory quota scheme. Hungarian PM Orban called it "mad and unfair". The standard reaction in Prague, Warsaw and Bratislava is that binding quotas are "unacceptable". In fact, the swiftness and gravity of the Commission's plan came as a genuine shock to policy-makers in the region. Ironically enough, they now find themselves aligned with Prime Minister David Cameron, whom they simultaneously accuse of seeking to undo the achievements of EU mobility by scapegoating migrants when pandering to the populist right and clamping down on their rights as part of the UK's confused attempt to renegotiate the terms of its EU membership. The Visegrad bloc (V4) is now the last defender of the patchy status quo in EU's post-Dublin migration and asylum regime. But the position is fast-becoming untenable - in political practice as well as in principle. As the European zeitgeist shifts in favour of decisive action, the politics of killing the resettlement scheme is increasingly tricky. It is for the first time since joining the EU in 2004 that Visegrad governments find themselves on the opposing side of such a formidable coalition, comprised of powerful member states, including Germany, as well as both the Commission and the European Parliament. Unlike Britain, Ireland and Denmark, post-communist countries can't resort to a pre-negotiated opt-out from Justice and Home Affairs legislation. They can probably muster a blocking minority, but would do so at the risk of alienating key allies. Above all, they could estrange Berlin, whose support they need on a host of issues ranging from Ukraine to resisting British revanchism on central and east European migrants rights. Visegrad governments insist that the migrant resettlement scheme be made voluntary - which is another way of saying they will not be the ones to volunteer. It is the sort of free-riding--or "egoism", as European Parliament President Martin Schulz put it--that elicits increasing frustration and contempt in Brussels and Berlin. Central Europeans point out that they are already doing their fair share by policing the eastern border. That, however, is European solidarity on the cheap: the entire eastern frontier saw less than 1275 irregular border crossings detected in 2014, compared to the 229,000 irregular migrants who sought to reach the EU's Mediterranean shores last year, according to Frontex. Should a serious migration crisis erupt as a result of conflict escalation in Ukraine, the odds are that the V4 would need assistance through exactly the kind of EU solidarity mechanism they now oppose. When it comes to accommodating refugees from Syria or North Africa--estimated in the range of several hundreds for each of the countries concerned under the Commission's formula--Visegrad governments argue it would disrupt the fabric of post-communist societies, given the lack of economic or administrative capacities, cultural incompatibility, or absence of existing family and kinship networks to help incoming migrants blend in. Underlying these arguments is a mix of paranoia, parochialism and misguided political expediency. It is difficult to overstate the degree to which the very notion of Islam--both as a personal experience and as a political issue--remains alien to the post-communist polity. The vast majority of Czechs, for example, may have never met a Muslim or seen a mosque, and yet--in fact, precisely for that reason--they are among the most hostile in their attitudes toward Islam in all of Europe. It is a sorry state of affairs in countries that have long been mistreated as the unknowable "eastern other" of Europe, and have suffered the consequences of this. These are societies that remember all too well how it feels not to be able to travel freely. Yet these are also countries that have benefited from the generosity of others when arriving as refugees from conflict, bad governance and limited opportunity. Today, V4 political elites lack the willingness--and perhaps even the vocabulary--to conduct a meaningful and productive debate on immigration that would, for instance, distinguish between refugees and economic migrants, or between regular and irregular modes of entry, thus overcoming the crude generalization of Muslim immigration as a threat to social, political and economic security. There is little inclination to consider the potential benefits of inward migration, just as they defend outward migration. No relevant political party in either country has dared come out in support of the Commission's latest proposals. Some argue that doing so would invite a populist backlash from xenophobic anti-European forces, especially if refugee re-settlement is cast as an imposition from Brussels. This is of particular concern to the liberals of the Polish governing Civic Platform (PO), who face a mounting challenge from the more radical and nationalist Law and Justice (PiS) party ahead of the October general elections. But pre-empting or pandering to xenophobia is a myopic political tactic that will only dent the countries' strategic interests and alliances in the EU. Torpedoing the Commission's plan threatens to undo all the hard work that they have done to overcome their previously peripheral status in the Union. With more than a decade of membership under their belts, Visegrad countries no longer pretend to have an informal opt-out from their link to Europe's south. In their current stance, they risk marginalizing themselves in the EU by pursuing a dishonourable position that undermines their status as reliable partners and solid EU citizens. The migration crisis presents an opportunity for Visegrad countries to step up, demonstrating they are ready to bear the costs as well as enjoying the benefits of integration. Regardless of whether the Commission's plan for binding quotas survives in its current form, they should volunteer to take part in the scheme, as the Irish government chose to do. It would be a smart political move, lending further moral weight to their call for safeguarding the rights of Polish or Hungarian migrant workers. That Visegrad governments contest xenophobia in the UK is to their credit. That they fail to do so domestically is hypocritical. It also risks the very existence of the Schengen zone that they prize so highly. The sooner the Visegrad countries grasp this connection, the better.